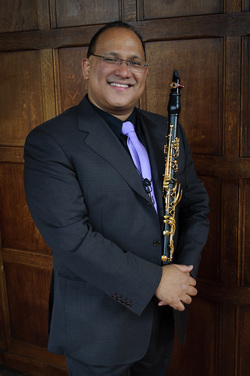 Ricardo Morales is one of the most sought after clarinetist of today. He joined The Philadelphia Orchestra as principal clarinet in 2003. Prior to this, he was principal clarinet of the Metropolitan Opera Orchestra, a position he assumed at the age of 21 under the direction of James Levine. His virtuosity and artistry as a soloist, chamber and orchestral musician has been hailed and recognized in concert halls around the world. He has been asked to perform as principal clarinetist with the New York Philharmonic, the Chicago Symphony Orchestra and at the invitation of Sir Simon Rattle, as principal clarinet with the Berlin Philharmonic. He also performs as principal clarinetist with the Saito Kinen Festival Orchestra, at the invitation of Maestro Seiji Ozawa. A native of San Juan, Puerto Rico, Mr. Morales began his studies at the Escuela Libre de Musica along with his five siblings, who are all distinguished musicians. He continued his studies at the Cincinnati Conservatory of Music and Indiana University, where he received his Artist Diploma. He has been a featured soloist with many orchestras including the Metropolitan Opera Orchestra, the Chicago Symphony, the Cincinnati Symphony, the Indianapolis Symphony, the Seoul Philharmonic and the Flemish Radio Symphony. During his tenure with the Metropolitan Opera Orchestra, Mr. Morales soloed under the baton of James Levine in Carnegie Hall and on two European tours. He made his solo debut with The Philadelphia Orchestra in 2004 with Charles Dutoit and has since performed as soloist on numerous occasions. An active chamber musician, Mr. Morales has performed in the MET Chamber Ensemble series at Carnegie’s Weill Recital Hall with James Levine at the piano, at the Santa Fe Chamber Music Festival, the Philadelphia Chamber Music Society, the Seattle Chamber Music Summer Festival, the Saratoga Chamber Music Festival, on NBC’s The Today Show, and with the Chamber Music Society of Lincoln Center. He has performed with many distinguished ensembles such as The Juilliard Quartet, the Pacifica Quartet, the Miró Quartet, the Leipzig Quartet and The Kalichstein-Laredo- Robinson Trio. He has also collaborated with Christoph Eschenbach, André Watts, Emmanuel Ax, Jean-Yves Thibaudet, James Ehnes, Gil Shaham and Kathleen Battle. Mr. Morales is highly sought after for his recitals and master classes, which have taken him throughout North America and Europe. In addition, he currently serves on the faculties of Temple University and the Curtis Institute of Music.